Urgh. This is an excellent implementation of a game that I can't stand. 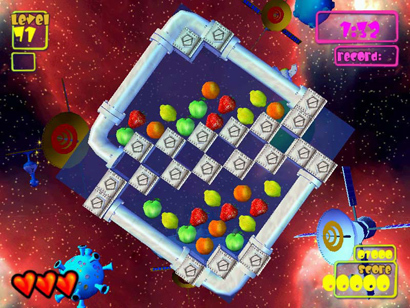 If you haven't heard of "Fruit Fall", it's a puzzle game where you have a maze on each screen and various pieces of fruit spread throughout them - the goal is to get all the like fruit adjacent to each other so they'll disappear and eventually clear the maze entirely. This is achieved by rotating the maze, 90 or 180 degrees at a time. It's possible this might appeal to you, and if so, more power to you, but I personally wanted to give up videogames forever after about three stages. Fortunately sanity was restored by a few rounds of Mr Do, but it was touch and go there for a while. If you're really curious about Fruit Fall, why not go here and play it for free? 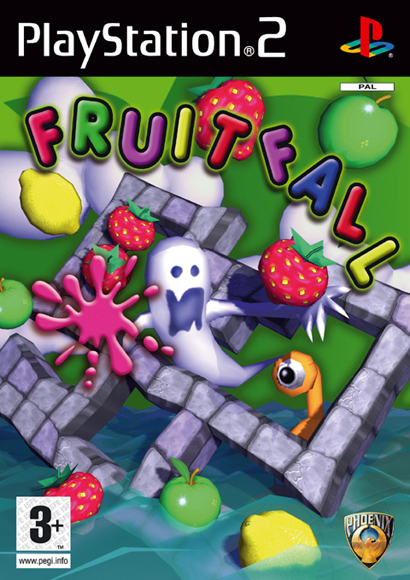 Sure, that's not as good as paying $AUS10 for the PlayStation 2 version, or even better $AUS50+ for the Wii version, called "Super Fruit Fall", but it'll do in a pinch. The good news is that it has yet another nice bit of music, some amusing if incongruous animations going on behind the playing field that keep the screen interesting without being too distracting, and there's apparently 75 stages of puzzles, so you'll be busy for quite some time. Good luck with that. Satan's own puzzle game.. and you thought Zuma was annoying.